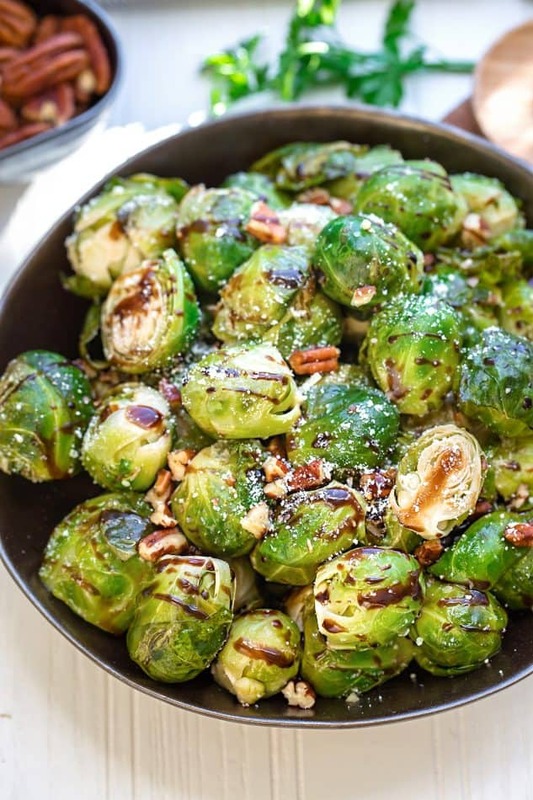 Slow Cooker Balsamic Brussels Sprouts + 2 More Holiday Side Dishes including Orange Ginger Glazed Carrots + Parmesan Sage Mashed Sweet Potatoes. All are perfect for freeing up your oven and best of all, they’re all set and forget recipes! Disclosure: This post is sponsored by KitchenAid. With the mad holiday rush this week, I’m popping in to sneak in one last recipe post for 2016. My favorite part about any big holiday meal is loading up on the side dishes. I can never decide on just one, so I love having a variety of options to choose from. 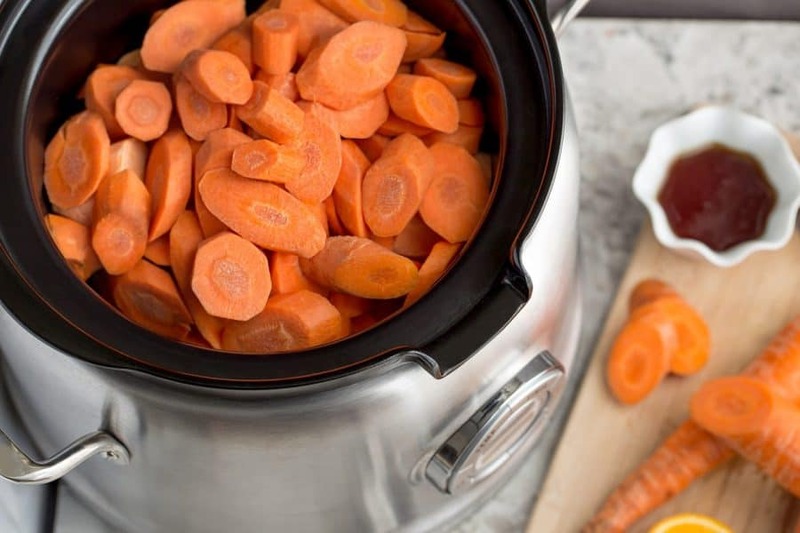 Making them in the slow cooker helps to free up some oven space and helps take the stress out of prepping multiple recipes. 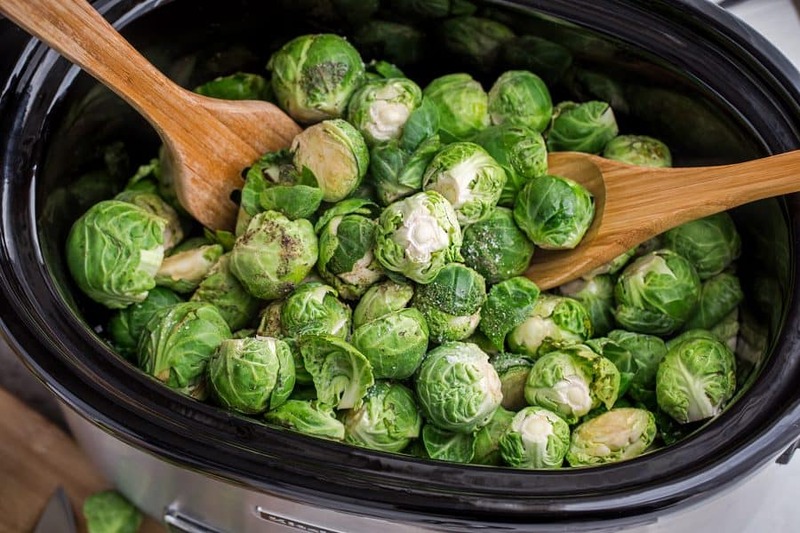 I am a big Brussels sprouts fan and my favorite way is roasting them in the oven, but last year, I started tossing them into my slow cooker on those days when I need my oven free. 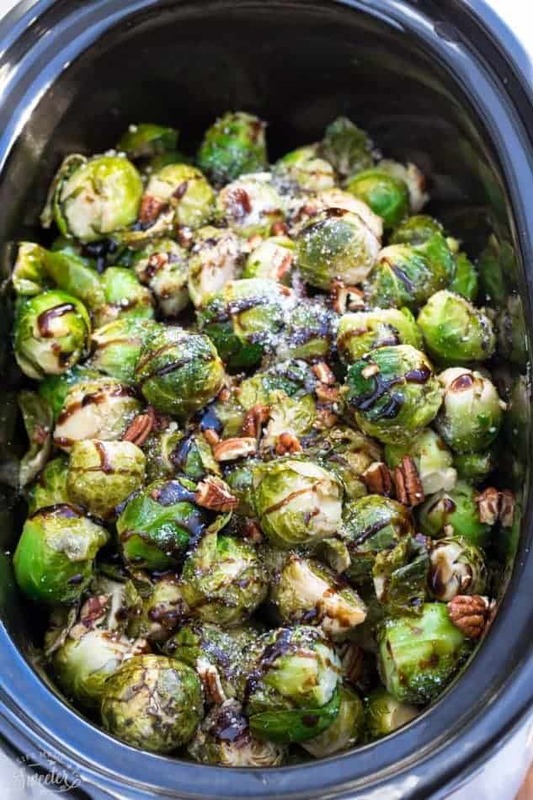 These Slow Cooker Balsamic Brussels Sprouts are so easy to prep in advance and you just add a drizzle of balsamic glaze and Parmesan cheese. I like to cook them for about 1- 1 1/2 hours on high — just until they are done and then I move them right away to a serving dish. This way, they still maintain that slight bit of crunch and have that roasted caramelized flavor you usually get from the oven. The sweet tang of the balsamic vinegar livens up these little mini-cabbages making them extra tasty with the sprinkle of Parmesan cheese and crunchy pecans. 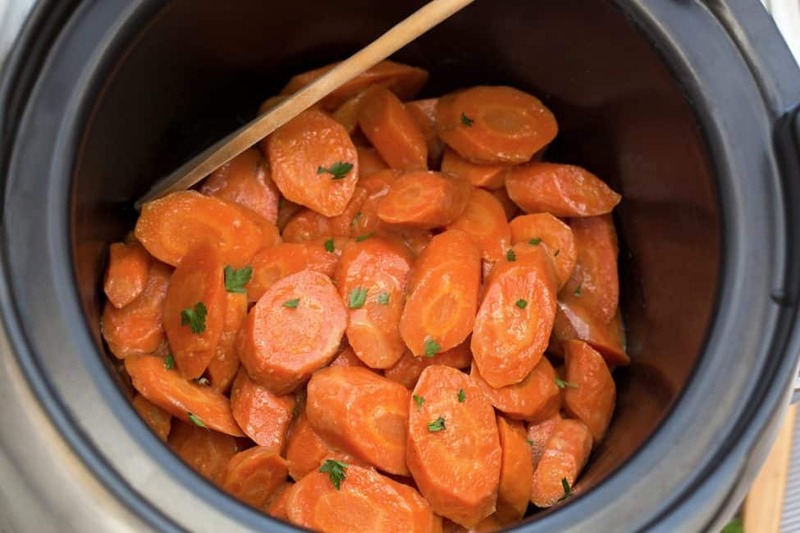 Next up are these Slow Cooker Orange Ginger Glazed Carrots. You just slice them up and toss them into your slow cooker along with the sweet and sticky glaze. 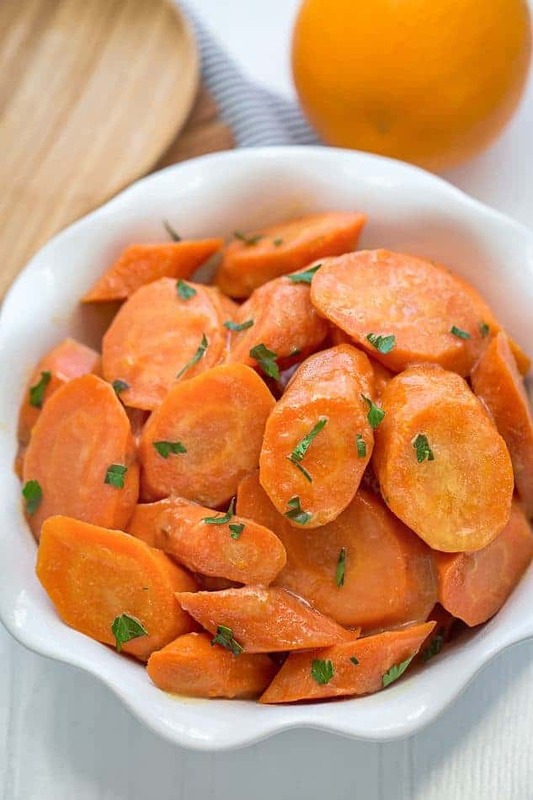 Super easy and the best part is that while the carrots are cooking, you’re free to walk away and continue on with preparing the rest of your feast. They get soft and tender after 5-6 hours and are infused with a sweet and flavorful orange, ginger and honey glaze. 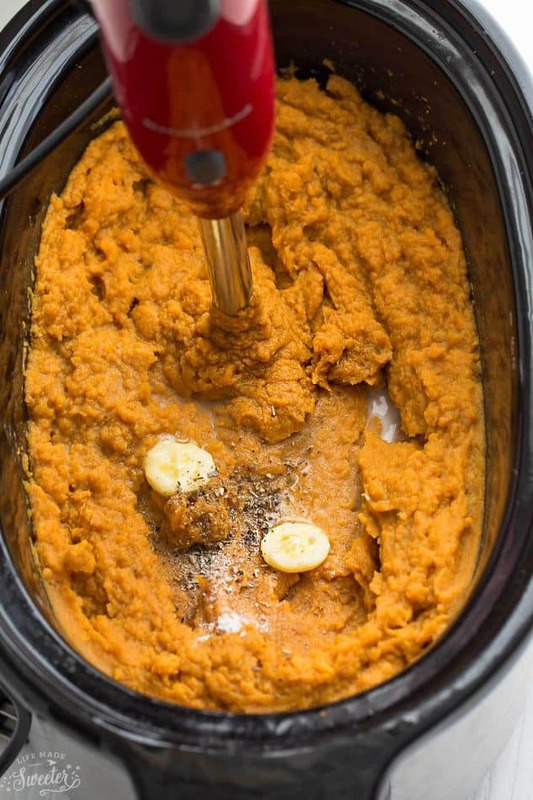 Finally, we have the Slow Cooker Parmesan Sage Mashed Sweet Potatoes. 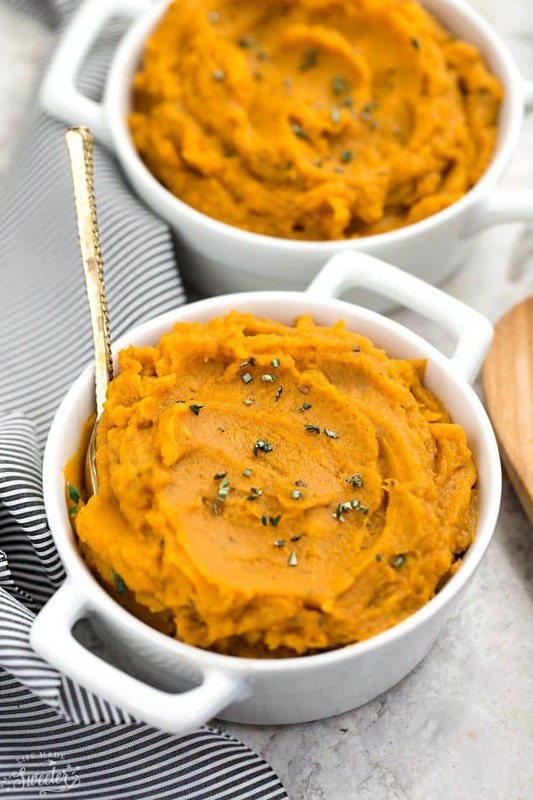 They are one of my kiddos favorites and they cook up easily in the slow cooker in about 2.5 hours on high in my slow cooker. No preboiling required! 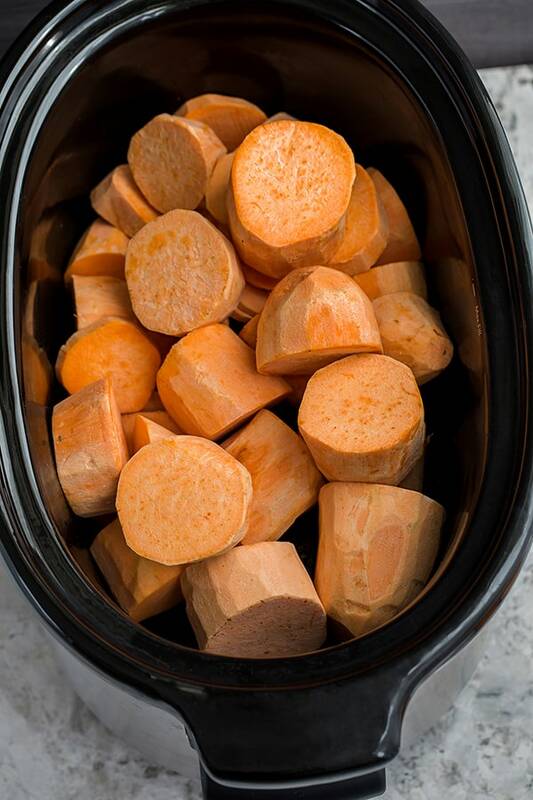 Just peel and slice the sweet potatoes and toss them in. Once the potatoes are done, I mash them directly in the slow cooker along with some butter, garlic powder, milk, sage, salt and black pepper using my hand blender. The great thing about these mashed potatoes is that you can make it ahead of time the night before and just heat it up before serving. 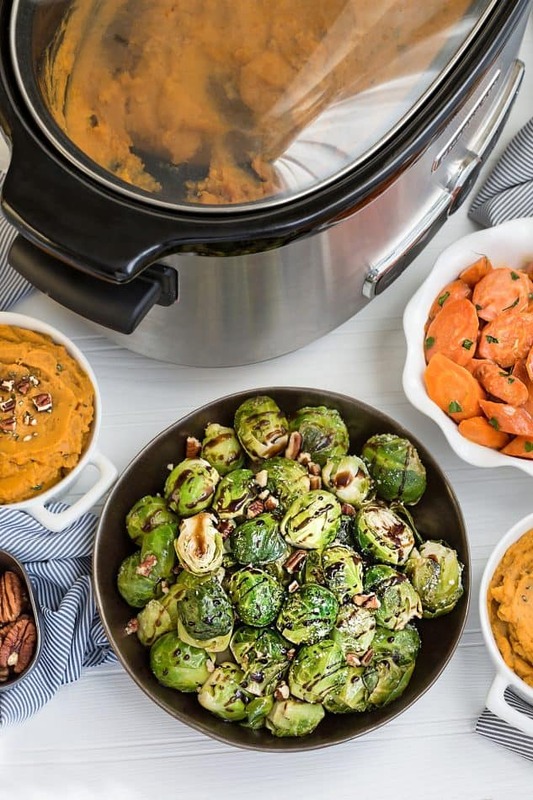 You can find all three of the full recipes and directions for the Slow Cooker Balsamic Brussels Sprouts, Slow Cooker Orange Ginger Glazed Carrots and Slow Cooker Parmesan Sage Mashed Sweet Potatoes over on The Kitchenthusiast where I am sharing them with their readers too! I also want to wish you all a merry and happy holiday season!! Thank you so much for all of your support this year! I hope you are able to enjoy lots of time with your friends and family! Disclosure: This sponsored post is created in partnership with KitchenAid. I was compensated for my time to create the recipes and photos, however, all opinions are 100% mine.